This is part 1 of the “How Unreal Renders a Frame” series, you can access part 2 and part 3 as well. I was looking around the Unreal source the other day and inspired by some excellent breakdowns of how popular games render a frame, I thought to try something similar with it as well, to study how it renders a frame (with the default settings/scene setup). Since we have access to the source code, it is possible to study the renderer source to see what it does, although it is quite a beast and rendering paths depend a lot on the context so a clean, low-level API call list will be easier to follow (looking into the code to fill in any missing gaps). 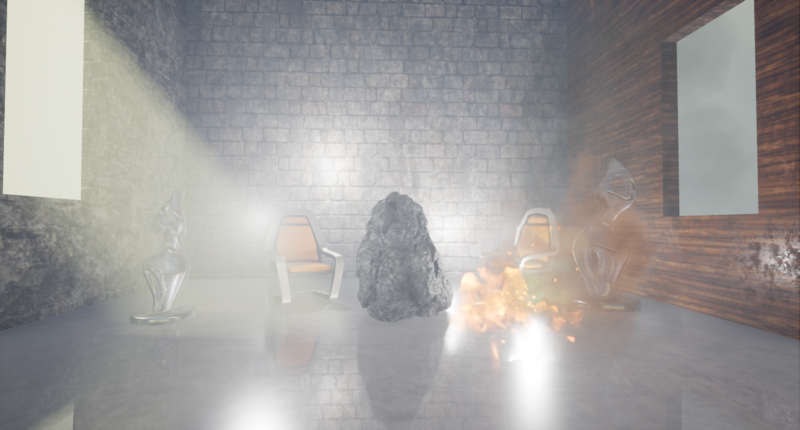 I put together a simple scene with a few static and dynamic props, a few lights, volumetric fog, transparent objects and a particle effect to cover a large enough range of materials and rendering methods. Disclaimer: the following analysis is based on the GPU capture and renderer source code (version 4.17.1), without prior Unreal experience really. If have missed something, or got anything wrong, please let me know in the comments. Helpfully, Unreal’s draw call list is clean and well annotated so it should make our work easier. 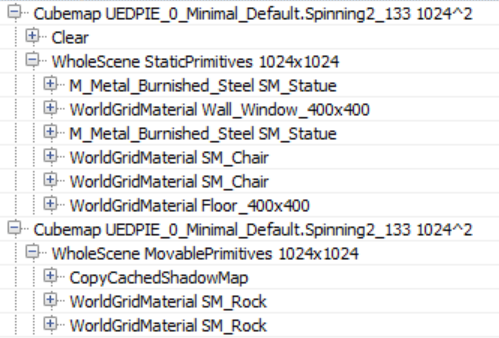 The list can look different in case you are missing some entities/materials in your scene or you are targeting lower quality. 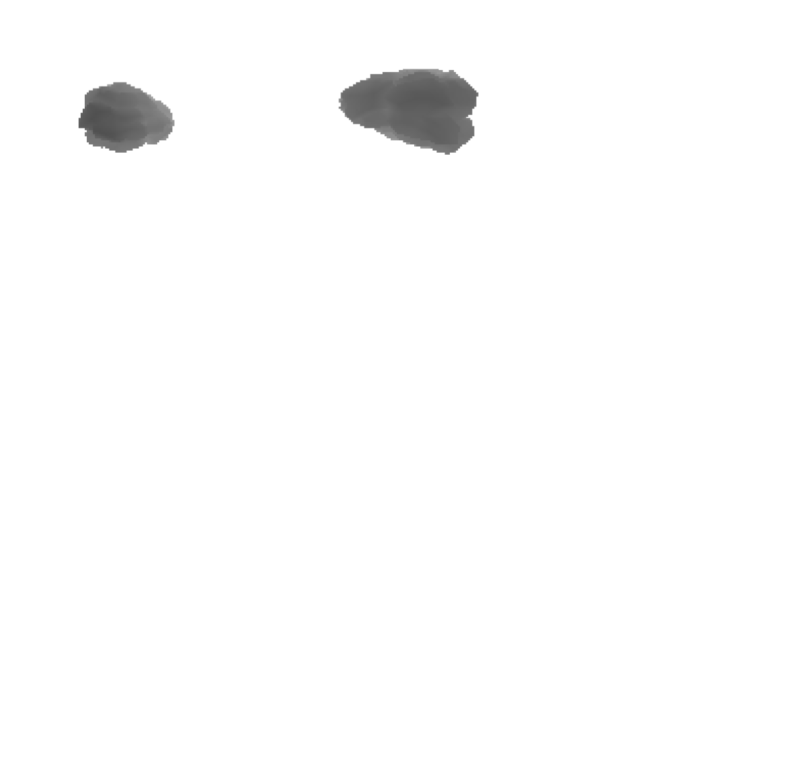 For example if you are rendering no particles, the ParticleSimulation passes will be missing. The SlateUI render pass includes all API calls the Unreal Editor performs to render its UI so we will ignore it, focusing instead on all passes under Scene. In this case the particle effect I added to the scene seems to have two emitters that require GPU simulation without collision, so the corresponding rendering passes can be run early in the frame. 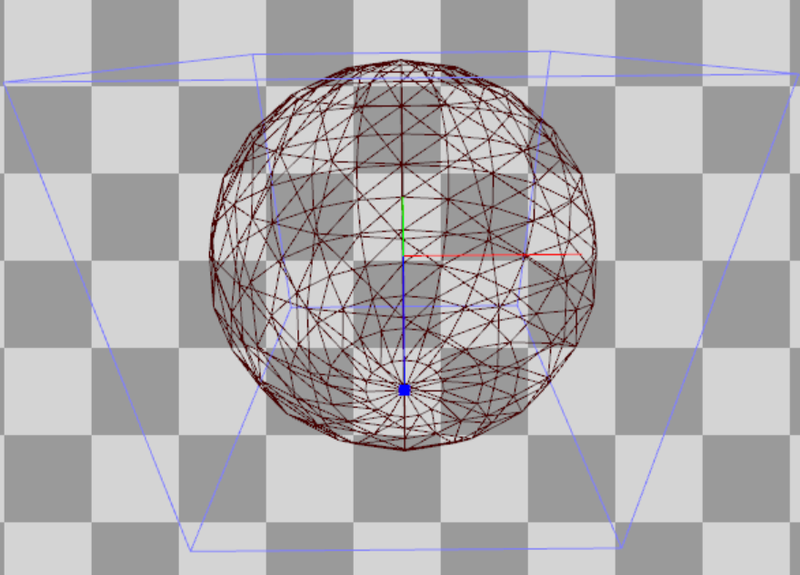 It is worth noting the Unreal uses reverse-Z when rendering to the depth buffer, meaning that the near plane is mapped to 1 and the far plane to 0. This allows for better precision along the depth range and reduces z-fighting on distant meshes. The name of the rendering pass suggests that the pass was triggered by a “DBuffer”. This refers to the decal buffer Unreal Engine uses to render deferred decals. 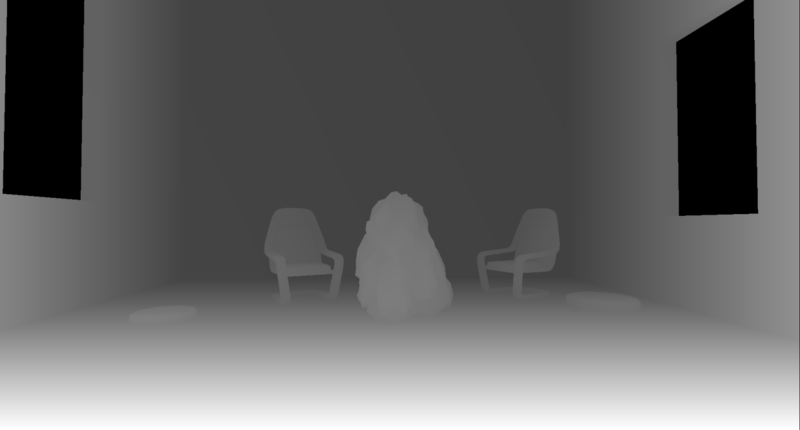 This requires the scene depth so it activates the Z-prepass. The z-buffer is used in other contexts though, such as for occlusion calculations and screen space reflections as we will see next. 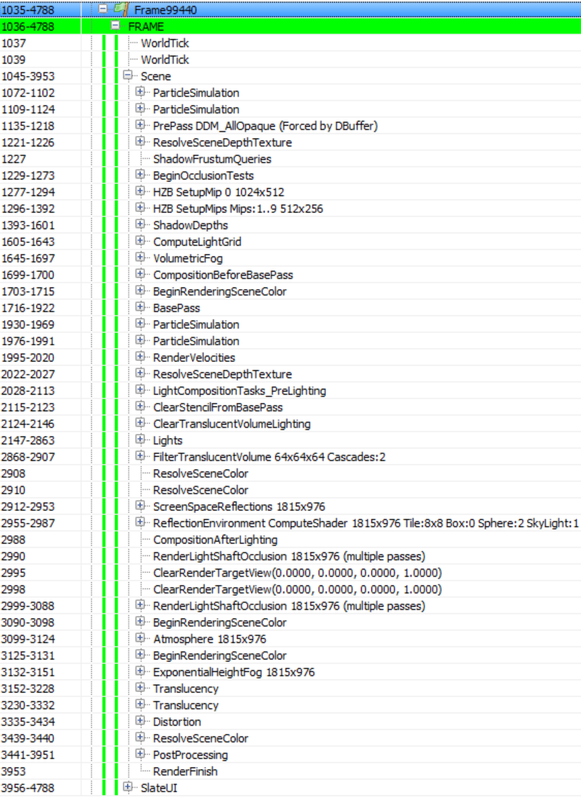 Some render passes in the list appear to be empty, like the ResolveSceneDepth, which I guess is for platforms that actually need “resolving” a rendertarget before using it as a texture (the PC doesn’t) as well as ShadowFrustumQueries which looks like it is a dummy marker, as the actual occlusion tests for shadows take place in the next render pass. We create an occlusion query, issue it and render the prop we wish to determine occlusion for. This is done using a z-test and the depth buffer we produced in step 1. The query will return the number of pixels that passed the z-test, so if it is zero this means that the prop is behind a solid mesh. Since rendering a full prop mesh for occlusion can be expensive, we typically use the bounding box of that prop as a proxy. If it is not visible, then the prop is definitely not visible. We read the query results back to the CPU and based on the number of pixels rendered we can decide to submit the prop for rendering or not (even if a small number of pixels are visible we might decide that it is not worth rendering the prop). Hardware occlusion queries have disadvantages such as they have “drawcall” granularity meaning that they require the renderer to submit one drawcall per mesh (or mesh batches) that needs determining occlusion for, which can increase the number of drawcalls per frame significantly, they require CPU-readback which introduces CPU-GPU sync points and makes the CPU wait until the GPU has finished processing the query. They are not that great for instanced geometry as well but we’ll ignore this for now. The CPU-GPU sync point problem Unreal solves like any other engine that uses queries, by deferring reading the query data for a number of frames. 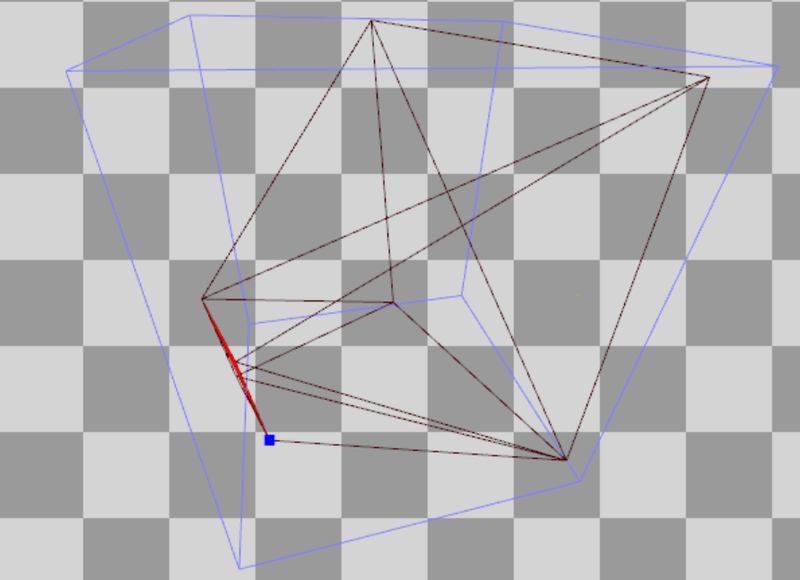 This approach works, although it might introduce props popping in the screen with a fast moving camera (in practice it might not be a massive problem though since doing occlusion culling using bounding boxes is conservative, meaning that a mesh will in all likelihood be marked as visible before it actually is). The additional drawcall overhead problem remains though and it is not easy to solve. Unreal tries mitigate it by grouping queries like this: At first it renders all opaque geometry to the z-buffer (the Z-prepass discussed earlier). 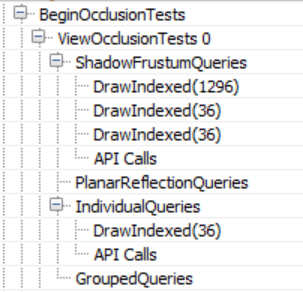 Then it issues individual queries for every prop it needs to test for occlusion. At the end of the frame it retrieves query data from the previous (or further back) frame and decides prop visibility. If it is visible it marks it as renderable for the next frame. On the other hand, if it is invisible, it adds it to a “grouped” query which batches the bounding boxes of up to 8 props and uses that to determine visibility during the next frame. If the group becomes visible next frame (as a whole), it breaks it up and issues individual queries again. If the camera and the props are static (or slowly moving), this approach reduces the number of necessary occlusion queries by a factor of 8. The only weirdness I noticed was during the batching of the occluded props which seems to be random and not based of spatial proximity. This process corresponds to the IndividualQueries and GroupedQueries markers in the renderpass list above. The GroupedQueries part is empty as the engine did not manage to produce any during the previous frame. Finally I assume that PlanarReflectionQueries refers to occlusion tests performed when calculating planar reflections (produced by transforming the camera behind/below the reflection plane and redrawing the meshes). Since Unreal uses reverse-Z, as mentioned earlier, the pixel shader uses the min operator during downscaling. Next follows the shadomap calculation render pass (ShadowDepths). 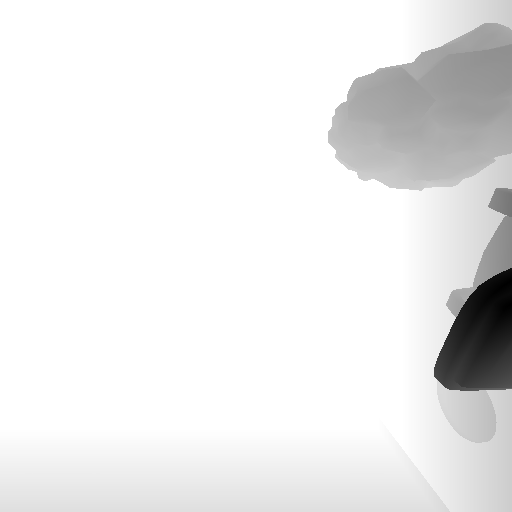 For stationary lights, the renderer bakes shadows for static props and calculates shadows only for dynamic (movable) props. 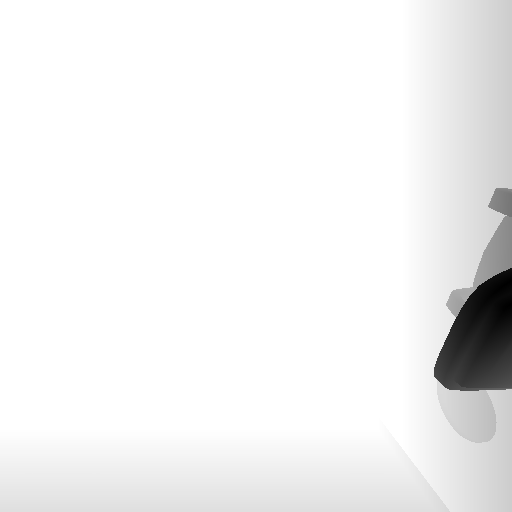 With movable lights it calculates shadows for everything every frame (totally dynamic). 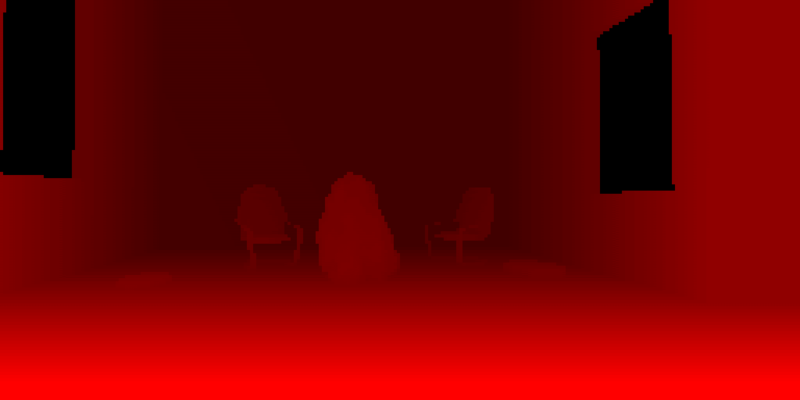 Finally for static lights it bakes light+shadows into the lightmap, so they should never appear during rendering. 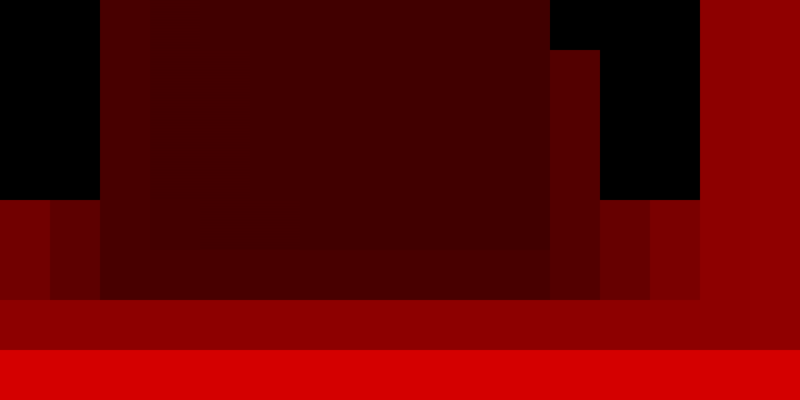 As the call list above corroborates, only Split0 has some geometry to render so the other tiles are empty. 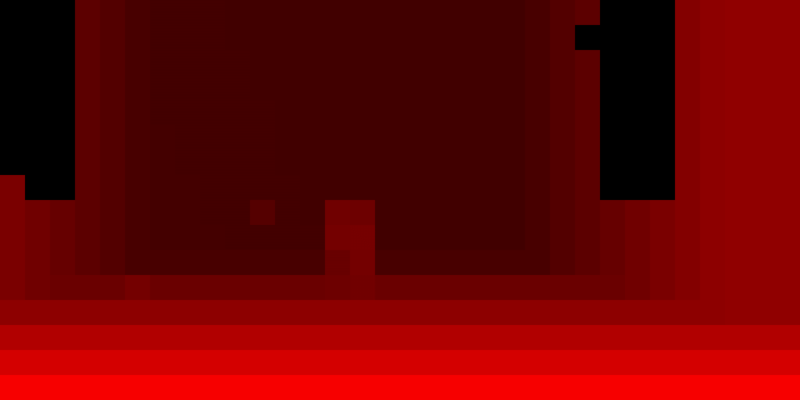 The shadowmap is rendered without using a pixel shader which offers double the shadowmap generation speed. Worth noting is that the “Stationary” and “Movable” distinction does not hold for the Directional light it seems, the renderer renders all props (including static ones) to the shadowmap. 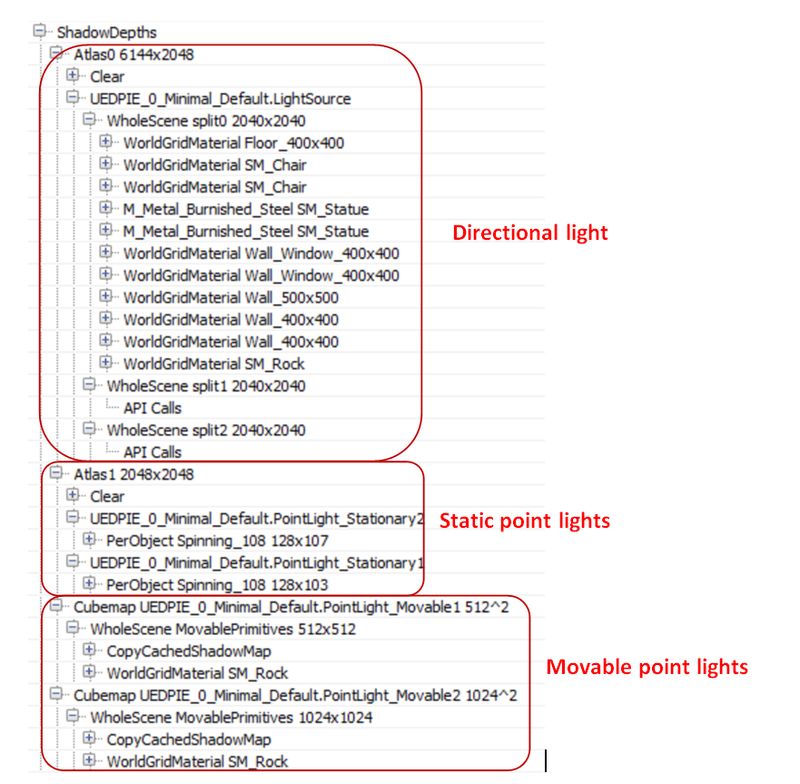 The single Static light does not appear at all in the drawcall list, confirming that it does not affect dynamic props only static ones through the pre-baked lightmap. Finally a word of advice, if you have stationary lights in the scene make sure that you bake lighting before doing any profiling in the Editor (at least, I am not sure what running the game as “standalone” does), Unreal seems to treat them as dynamic, producing cubemaps instead of using per object shadows, if not. In the next blog post we continue the exploration of how Unreal renders a frame by looking into light grid generation, g-prepass and lighting. Breakdown on how Unreal renders a single frame. Essential reading in my opinion.